Enterprise productivity has gone mobile. Are you ready to support it? Smartphones and tablets have become the tools of choice for today's workers - adding a whole new world of concern for corporate IT. How do we protect corporate data? What devices are accessing email and network resources? What does a Bring Your Own Device program truly mean for security and corporate liability? If you have asked even one of these questions, the time to implement a mobile device management (MDM) strategy is now! But where should you begin? 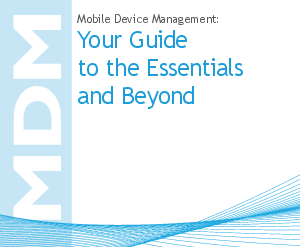 There's more inside, download your free MDM Basics Guide today.